Yum, raspberries! So sweet and tasty, whether you are eating them plain or with ice cream. But how much do you really know about raspberries? Facts like they have no fat, they come in four different colours and what states and provinces grow the majority of raspberries in Canada and the United States. 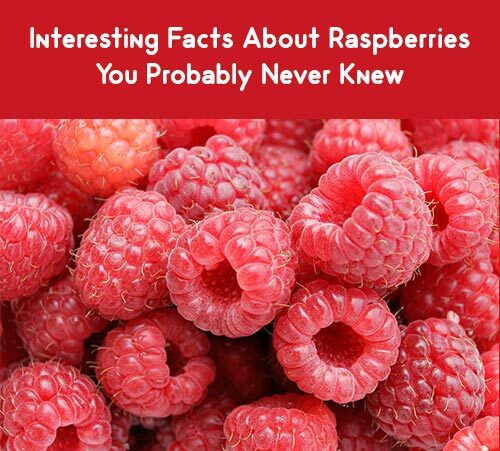 Learn these facts, plus read about interesting trivia, nutritional facts, what recipes raspberries can be used in and three myths that talk about raspberries. Raspberries can be either red, purple, gold or black in colour. Golden raspberries are sweeter than the other varieties. The difference between raspberries and blackberries is that raspberries have a hollow core in the middle while blackberries do not. In the United States, about 90% of all raspberries sold come from Washington, California and Oregon. In Canada, the province of British Colombia produces about 80% of all raspberries sold in Canada. When picking raspberries, look for berries that are firm and dark in colour. They should not be soft or mushy. Gently pull on the berry; if it does not come off easily then leave it on the bush, as the berry is not ripe enough yet. Once raspberries have been picked, they won’t ripen any further. They are high in fiber, vitamin C, potassium and folate. They can help lower high blood pressure. Raspberries have an anti-inflammatory property that may help to reduce inflammation of the joints.